Opening Week is finally here! With all of the talk and preparation, no one can prepare you for the real thing. Hawkstown has been a busy place this week; everything from free Papa Murphy’s pizza, to big purple guys, to Pitcher John Mincone and Humphrey the Hawk having an epic showdown in Wii Baseball. This week has been a whirlwind of events and the funny thing is that we are only two games into 38 home games this season! Having lived through two Opening Nights, I have to admit that this one paled in comparison to last season’s with the Indianapolis Indians. From the time I came into the office at 8:30 a.m., the office was in a state of organized chaos. From hanging banners and televisions in the Sky Box, to trying to find extra tables and chairs, I had plenty to keep me busy. Aside from minor glitches (which are bound to happen on any given night), things ran extremely well. The sell out crowd of 3,438 got a great show that included fireworks, plenty of entertainment, and great food from Home Plate Food Services. Even though the Hawks lost to Salem-Keizer 5-2, there were some bright spots on the field. Hawks Relief pitcher Carlos Rojas showed off an impressive curveball that struck out three Volcanoes. Carlos has one of the better curveballs that I have seen and with time, he could find himself working his way up the ladder. 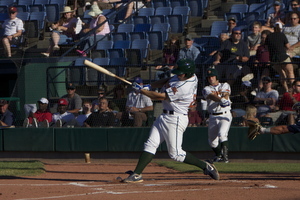 Whether it was the four stolen bases or the back-to-back home runs by the Volcanoes, they prevailed and took the first game of a five game set against the Hawks. 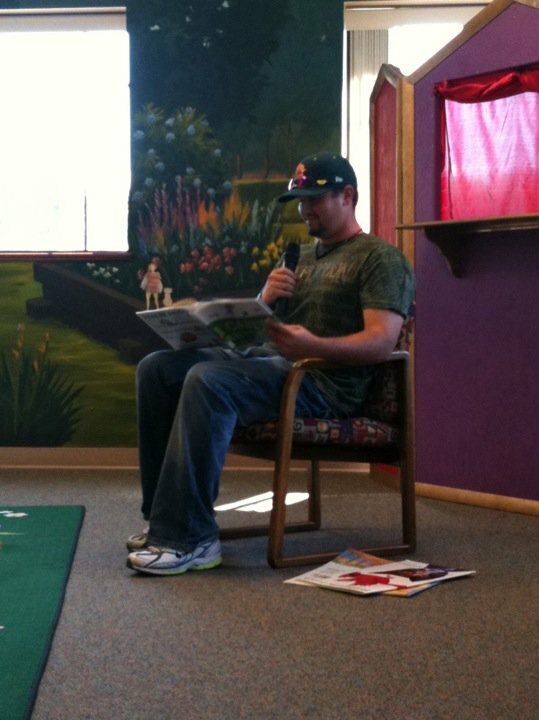 After recovering from a long and busy night, we were back at it on Tuesday only this time, we had a little fun with the nice people at the Garden City Library. 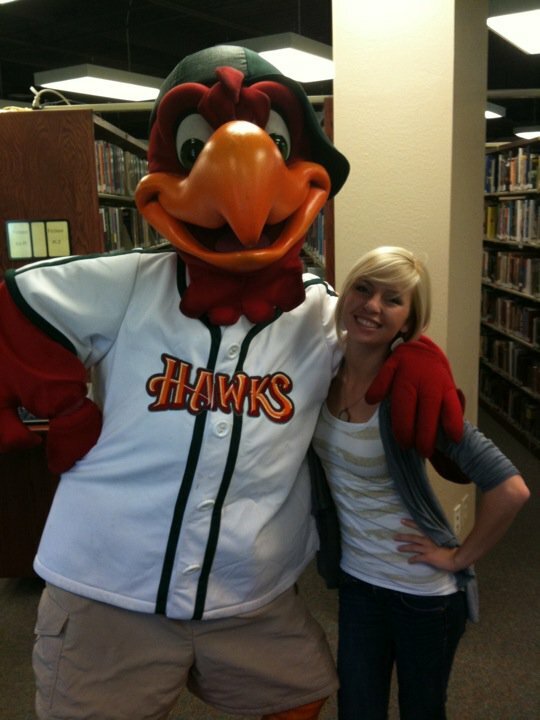 Hawks Pitcher John Mincone and local Boise legend Humphrey the Hawk, made an appearance at the Garden City Library yesterday. 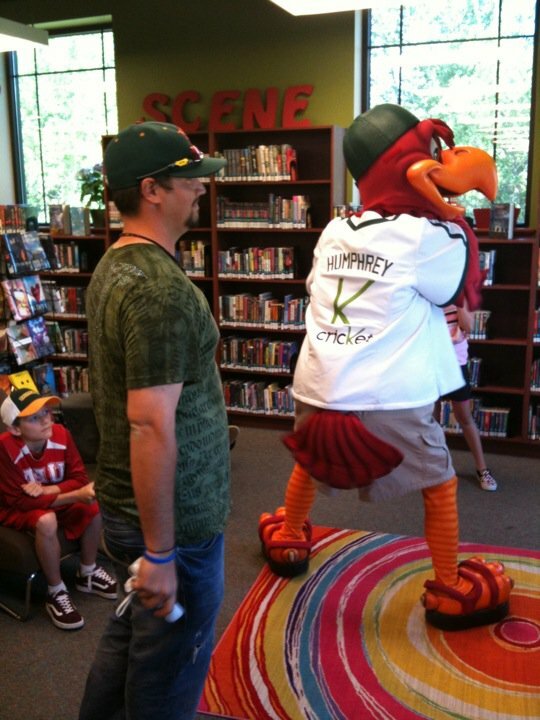 John read three stories to a plethora of young Hawks fans and Humphrey provided some entertainment, even challenging John to a game of Wii Baseball! Whether it’s on the Wii or on the mound, John had his pitches working for him as he struck out Humphrey on multiple occasions in rout to a 1-0 victory. But John got plenty of time in as he was challenged by multiple kids and he was even taken deep with a home run by a kid who had to be around five or six years old! After we had a workout with the kids at library, it was game two of our five game set and needless to say, the bats had more punch than Mr.T in Rocky III. 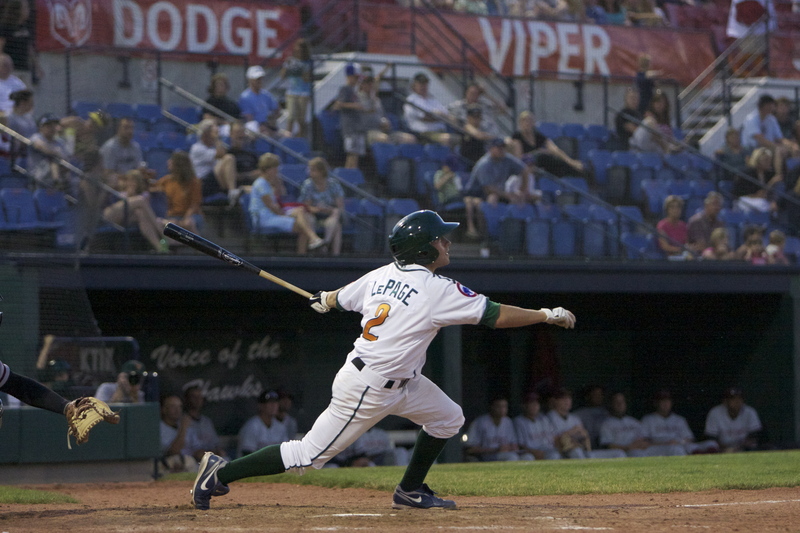 The crowd of around 2,000 watched the Hawks score runs in five consecutive innings in rout to a 6-2 victory. 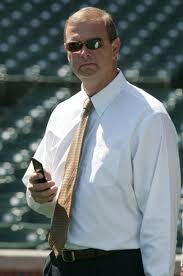 Third baseman Brandon May started it off with an RBI double in 1st inning and from there, the Hawks never looked back. Left fielder Alvaro Ramirez hit a two-run home run and first baseman Richard Jones hit a monster shot over the right field wall in the 3rd. 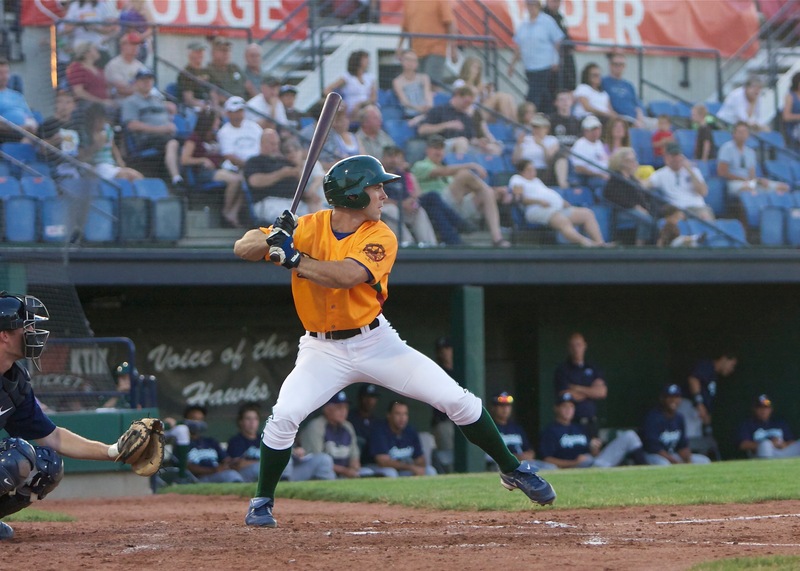 Last night was also a historic night for designated hitter Chris Huseby (who also spends time as a relief pitcher) and catcher Jeff Vigurs (who earned his first start after being drafted in the 22nd round of this year’s draft). Both guys got their first professional hits in the bottom of the 2nd and Vigurs also managed his first professional RBI and stolen base in the same inning! Vigurs earned the Northwest Dodge Dealers Player of the Game as he went 3-4 with an RBI, R, and SB. Tonight should be just as exciting and entertaining as last night. Pitcher John Mincone will look for redemption tonight and with an offense that is beginning to find it’s groove, it would be hard to bet against the Hawks. If this home stretch has taught me anything up to this point, always expect the unexpected.